Versatile Ultrasonic Inspection system can be applied to tube, pipe and bar-stock applications. 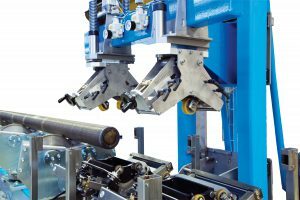 Precision conveyor with powered roller heads automatically calculates and maintains helical pitch of inspection. Multi-channel Test Head Assembly with easy one-knob adjustment for different diameters. Tolerates materials with lack of straightness. Material diameters between 50mm and 355mm (2”-14”) without changing bushings or glands. Uses familiar Echomac® FD electronics. 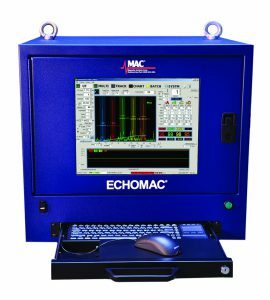 At the heart of the Echomac® Full Body Tester for Ultrasonic (UT) Testing of Spinning Tube and Bar is the unique Adaptive Pitch Control (APC) transducer carrier and the precision design ”Spin- The-Tube/Bar” conveyor. 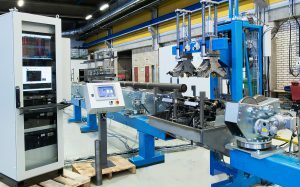 With the use of a simple dial-in pitch controller, the operator can set a precise angle of helical pitch for the conveyor’s rotation of the tube/bar. The conveyor spins the material longitudinally past the ultrasonic transducers at the correct pitch, and the APC follower rolls automatically adapt to this angle. Handles material size changes with just one knob to adjust the roll separation, using the convenient diameter scale. Detects longitudinal and transverse defects, wall thickness and lamination to the 5% and 10% level in tube. Also detects inclusions in bar. Tests materials with ovality, and ones that are not as straight as is usually required by other test systems. Can be seamlessly installed into an existing production line, whether new or an upgrade of an older unit. Eliminates the need to adjust transducers for different tube or bar diameters. Ensures that sound entry point and incident angles remainconstant for any material size. Can be configured for 5-direction capability. Uses multiple UT element arrays and/or discrete elements, depending on test specifications. Includes premium grade precision conveyor, designed from the perspective of nondestructive testing (NDT) for spinning tube or bar applications.